Dec 31 – New year. New me. Time to make those New Year resolutions. Hmm. “I resolve to lose weight.” Last year’s weight loss resolution was so successful that I gained more weight just so I could try again. Check. What else? Let’s try a more general resolution like “I resolve to be a better person.” Last year, I tried to be a better unicorn. Goal achieved, so this year, I’m up for a challenge. Better person it is. Check. “I resolve to resolve all my problems with Resolve.” Clean sweep for the New Year. Check. “I resolve to buy more Christmas socks before the end of 2014.” That one should be easy to keep, and I’ve given myself all year to achieve it. Check. 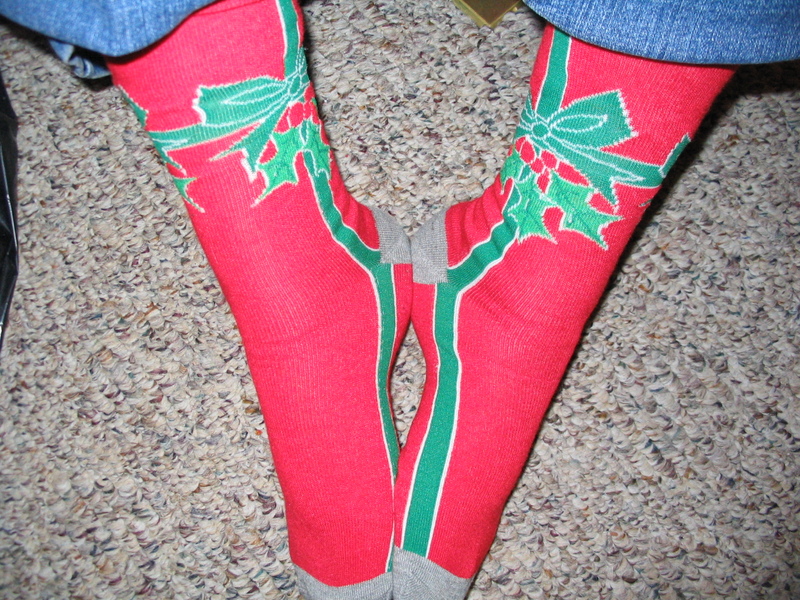 I resolve to bring about “Peace on Earth” or at least wear socks about it. Check. I learned long ago that I can’t keep resolutions. Maybe some people can, but to me, a resolution is like setting myself up to fail. I don’t think that’s a good way to start a new year. I prefer to go into the New Year clueless. It’s messier and more organic than a list of resolutions, but I’ve found that I can’t force change. If I do, it won’t stick. So I like my change to come organically, welling up from the inside until it comes to the point where there’s nothing else I can do but make a change. There’s probably an easier way, but I’ve never done anything the easy way. That’s just not me. I’ve made some changes in 2013. They are changes that excite me, rather than ones that drag me down with worry about whether or not I’ll be able to keep them. When I slip up on my organic goals, I’m much more forgiving of myself. I think that’s because I’m ready for the changes I’m making, but I’m also happy with where I am in my life. I’m content. So this year, I’m just going to ride out the winter, continuing to make the changes that I can make, and awaiting the changes that the Good Lord has in store for me this year. Some will be good, some won’t, but I’m just going to keep on keeping on. 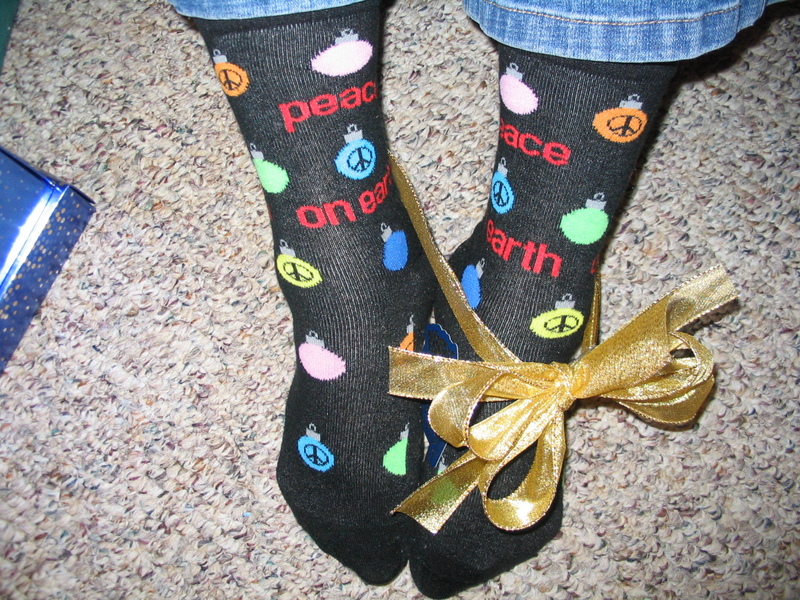 The one change I’d really like to see for 2014 is “Peace on Earth” in places other than my socks. Happy New Year! 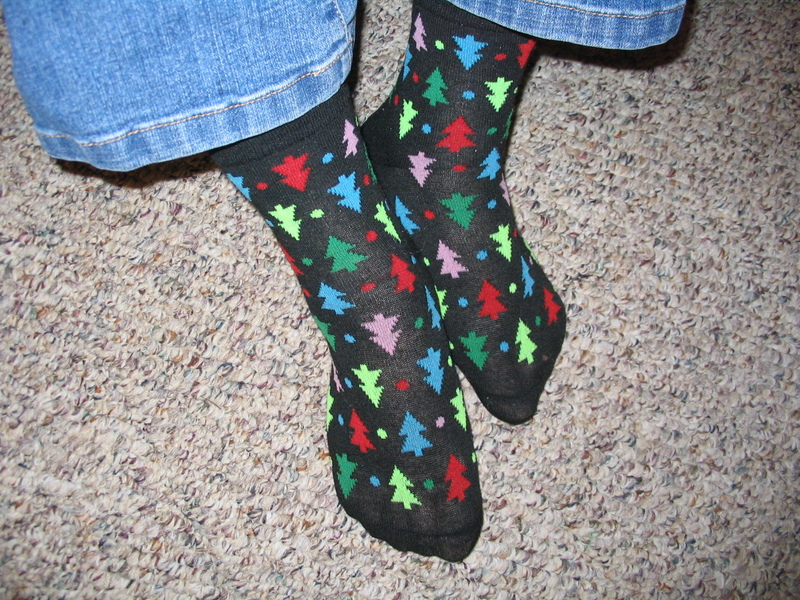 Dec 30 – I blew it yesterday and didn’t get anything posted, but since these socks are so cute, I slipped them back on for a minute and took a picture of them. Sometimes, life gets ahead of a person. That’s what happened yesterday. So my December 30th post is being posted on December 31st, along with today’s post. Expectations are funny, aren’t they? If you were expecting a post from me yesterday, you might have been disappointed, but today you get two posts. Having to wait can have its own rewards. That’s all I wanted to say about my socks from yesterday. 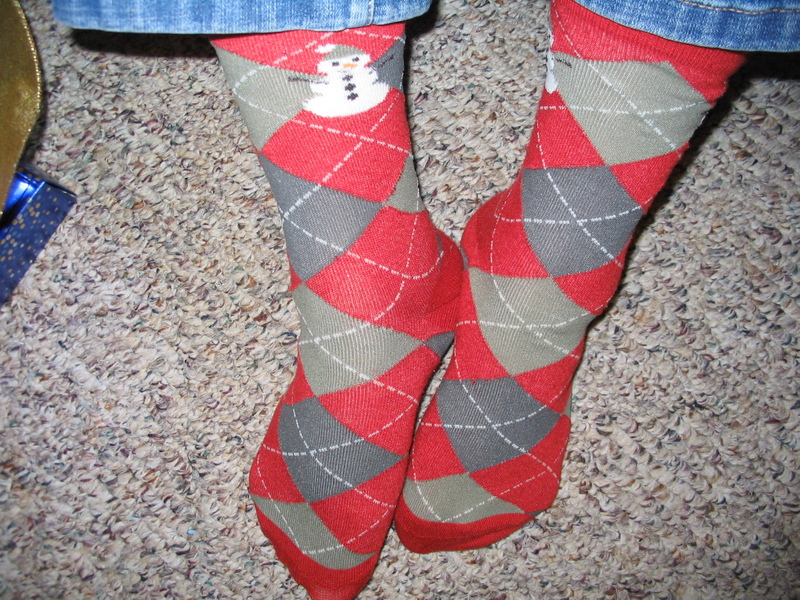 It would have been a shame to not show off the cute little snowman who was just hanging around on my socks. All right, Mr. DeMille, he’s ready for his close-up. This post will be short and sweet tonight, but that’s not a description of today’s socks. 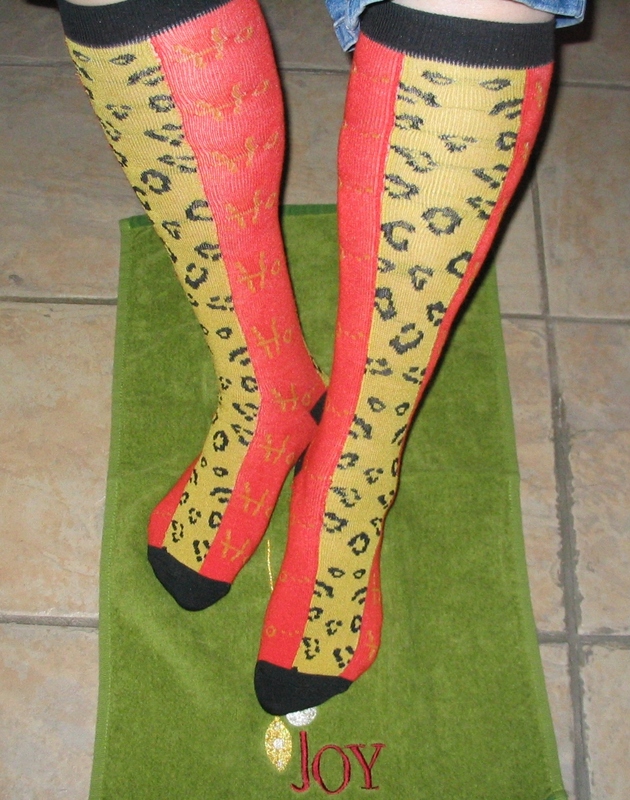 These ones are long and crazy – knee highs with leopard spots and ho ho ho’s. Woo hoo! Party animal socks! In a couple of days, we’ll be ushering in the New Year with celebrations, so I have to get my party on a little early because as soon as I watch the ball drop at 12:00 on New Year’s Eve, at 12:01, I’ll be heading to Snooze City. These socks are as party animal as I get. The start of the New Year signals some changes. 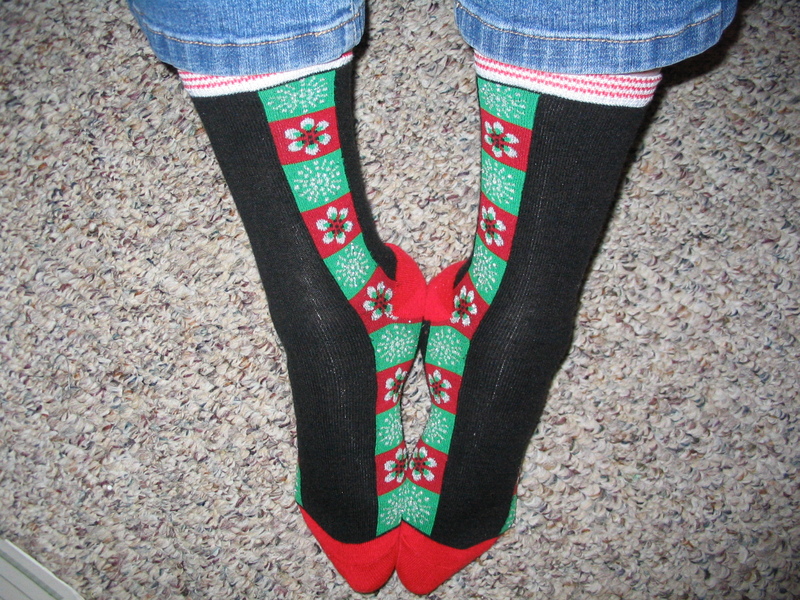 Because it will no longer be Christmas Sock Season, you won’t have to see photos of my feet any more. (Thank you for enduring, gentle reader.) Therefore, December 31st will be my last sock post, but I plan to continue posting about other things to my Word Press blog as soon as I can expand my site. Care to join me? My posts might not be party animal lively, but they won’t be Snooze City either. Let’s have some fun. This is a boring week. Even my socks are boring. Sure, they’re colorful, but the tree pattern is repetitious. It redundantly repeats over and over again without ceasing, unchanging. Yawn. Christmas is over. The excitement of The Day is gone. The presents have been unwrapped, the feast has been eaten. Only leftovers remain, if you’re lucky. A day or two of rest in the refrigerator, and they’re better than the original meal. Christmas is winding down, as we begin to contemplate the coming New Year celebration. Come this time in another eleven months, we’ll be rushing around trying to secure a piece of holiday spirit for ourselves once again. It’s a roller coaster ride throughout the rest of the year. One thing remains constant, however, and that is that we are living in the time of the evergreen promise, that of salvation. Like evergreens that consistently retain their leaves in all four seasons, Christians can count on the assurances given by the baby in the manger and fulfilled on the cross. God will love us, without changing, throughout all the seasons of our lives. That’s the evergreen promise, and it’s always exciting. This is a love story today. My hubs has been so wonderful and generous this Christmas. I’m a worrier. His thoughtfulness has gone a long way to relieve some of my worries. We live in a nice house, not a well-built house, but a nice house. It has its issues, and those issues worry me. Our bedroom light has been bad for some time. It’s a fan/light combination, and the light is not working. One of my presents this Christmas was Hubs making arrangements to have an electrician come and fix it. He researched electricians, made the call, set up the appointment. I didn’t have to lift a finger. Today, we drove to the far side of the city to look at lighting and bought a new fan/light fixture. It was a nice day together. I will miss him when his vacation ends with the New Year. After thirty-five years, I’m still touched by his thoughtfulness. We’re just like a matched pair of socks. It doesn’t matter what’s on the socks, as long as we’re a pair. He still surprises me as I unwrap the gift that is my husband year after year. I’m a lucky gal. Is anyone else as tired as I am? Hubs wanted to know if I wanted to go to a movie today or if I wanted to laze around the house. It was his fault. He gave me the option. So we lazed around the house today. After the hectic yesterday, it was nice to sit, play with Christmas gifts and just relax. No big meal to prepare, no more presents to wrap, no more decorating to do, but frankly, I confess: I haven’t had enough Christmas yet. Even though Christmas Day was tiring, I’m not ready to let go of the good cheer that I saw this year. A kind clerk gave me $50 off a purchase of mine. I received a thank you from the Fedex guy for the cookies that I set out for him. A neighbor offered to help clear our driveway of snow after church. We offered to take in their mail while they were away. 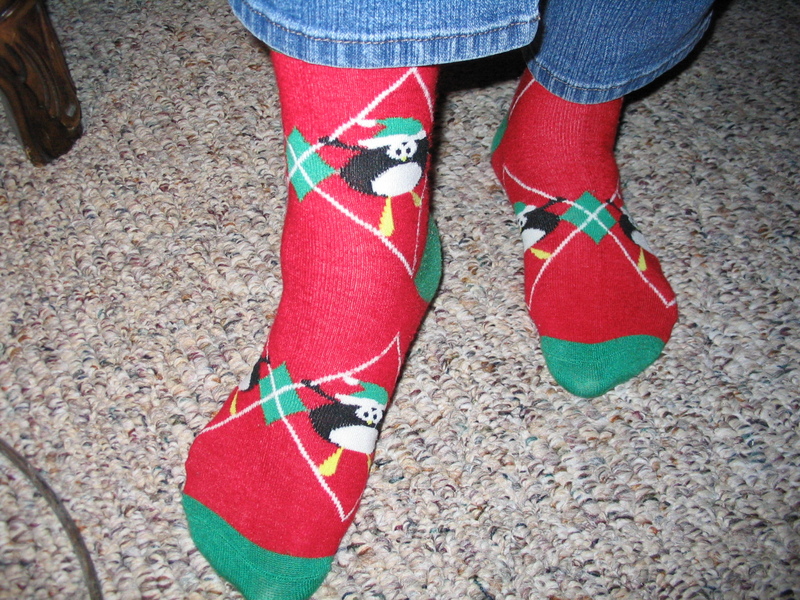 I’m not ready to let go, so on go the Christmas socks once again, this time with plaid penguins for a few more days of good cheer before we all forget until next December. Presenting my Christmas Day socks. May the Present of God be present in your life every day throughout the coming year. Merry Christmas!